The fermentation process to produce alcoholic beverages goes back about 12,000 years. Since wine, beer, and bread were basic staples of the European diet, and these are made with yeast, scientific attention was focused in its direction. Yeast was long known to be an integral component of the fermentation process, but the nature of that role was alternatively thought to be either the result of causing chemical instability in the substrate (as grapes) or a physical process. In 1837 and 1838, three scientists independently came to the same conclusion: yeast was a living organism. Starting in 1857, and over the next twenty years, Louis Pasteur conducted a series of studies establishing that fermentation involved living organisms, namely bacteria and yeast—studies intended to solve practical problems. The first series of experiments involved lactic acid, the simplest type of fermentation. Pasteur observed that when the sugar lactose was fermented in the presence of the bacterium lactobacilli, lactic acid was formed, and that lactic acid was responsible for causing old milk to have a sour taste, the same phenomenon that gives yogurt its sour taste. During the 1860s, Emperor Napoleon III called upon Pasteur to investigate a major French crisis, the souring of wines. Pasteur’s solution was to heat fermented wine to 140°F (60°C), a temperature that kills the microbes responsible for spoiling the wine but not sufficiently high to alter its taste. This same process, called pasteurization, was later successfully used for beer and vinegar. (Pasteurization of milk was first to appear in the US in 1893.) Pasteur’s interest in fermentation and microbes led to his contributions to the development of the germ theory of disease. SEE ALSO: Leeuwenhoek’s Microscopic World (1674), Enzymes (1878), Germ Theory of Disease (1890). The first practitioners of fermentation were hunter-gathers seeking to produce wine and beer, and the role of microorganisms in the fermentation process was discovered by Louis Pasteur in the mid-nineteenth century. 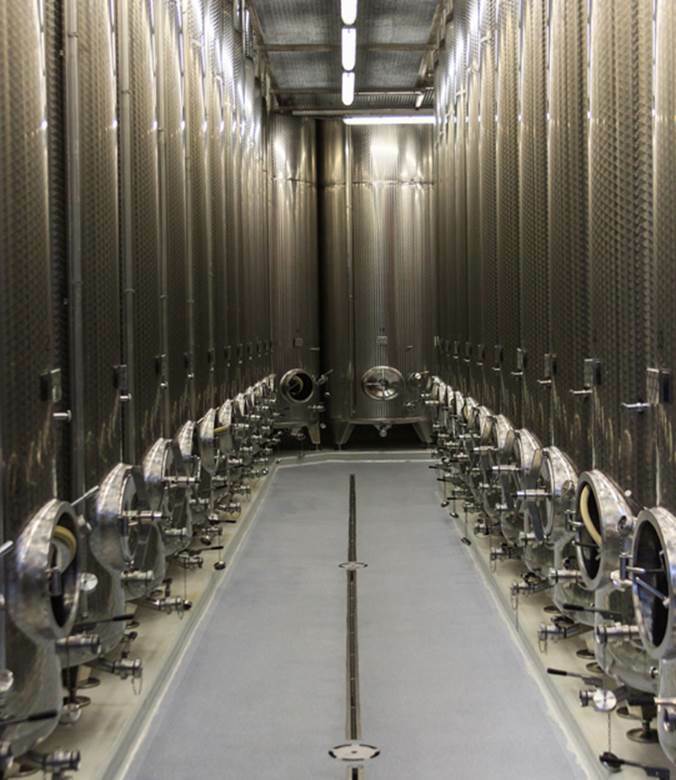 This image depicts modern winery steel tanks.